Last year we spent some time with the worker placement game Viticulture (review here), the first offering from publisher Stonemaier Games. This ended up being a surprise hit for us and has made it to our gaming table many times since then. Well today the brains behind Viticulture are back and this time they are adding new game play elements with their Tuscany expansion. 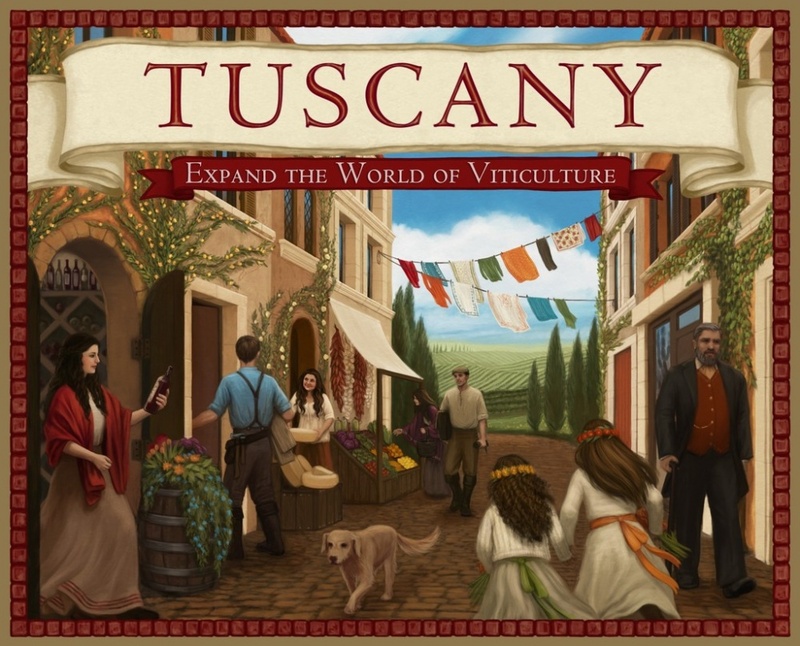 Now in funding on Kickstarter, Tuscany seeks to both improve Viticulture’s game play and give players more options for running their pre-modern vineyard. Is Tuscany a worthy addition to Viticulture? Read on to find out! Tuscany is no ordinary game expansion. Stonemaier Games has packed 8 different modules into Tuscany for your wine making pleasure. That’s right; Tuscany is filled with quite a few new ways to play Viticulture. While that may seem a little daunting, the expansions actually vary a great deal in complexity and many of them will seamlessly integrate into the base game. 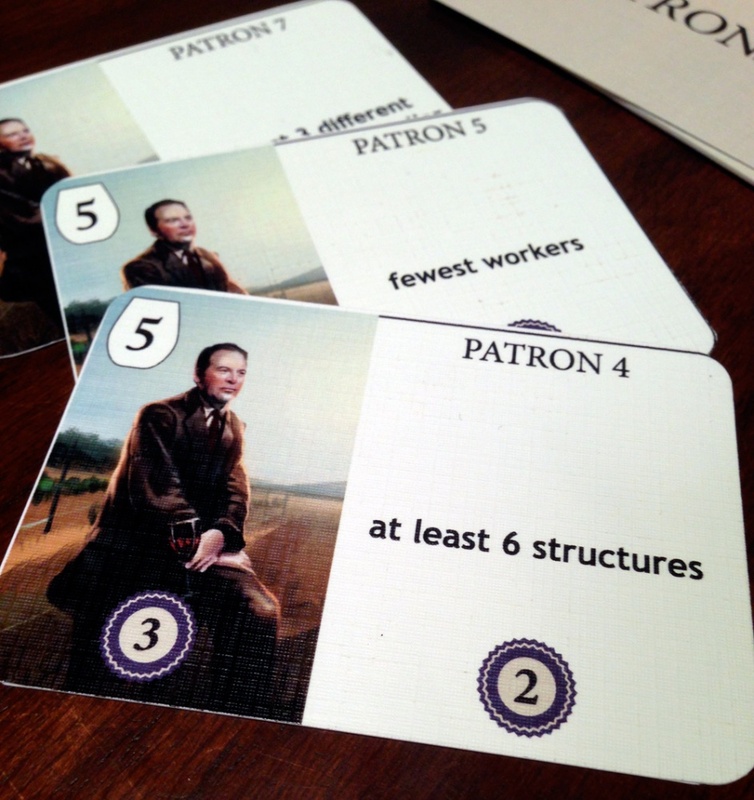 The new worker cards in Tuscany seek to be useful during any point of the game. Even still, I can’t imagine many of you will want to immediately add 8 new ways to play a game in one sitting. Well you’re in luck, because you are not supposed to. Tuscany is a “legacy style” expansion. 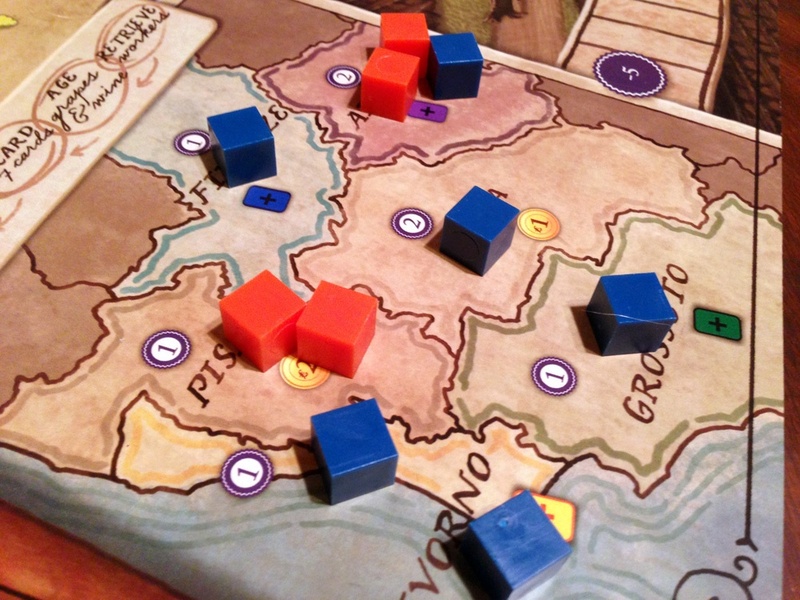 Borrowing the term coined by Rob Daviau in Risk: Legacy, Tuscacy will ease you into its new modes of play. After each game or three of Viticulture (decided by the players ahead of time), you are to “uncork” a new expansion. Just about all of the modules we will look at today are meant to always be part of Viticulture once added. So, after spending a good amount of time with Viticulture you will have a deeper, more expanded game to always play. With that in mind, let’s dig in to what’s new. 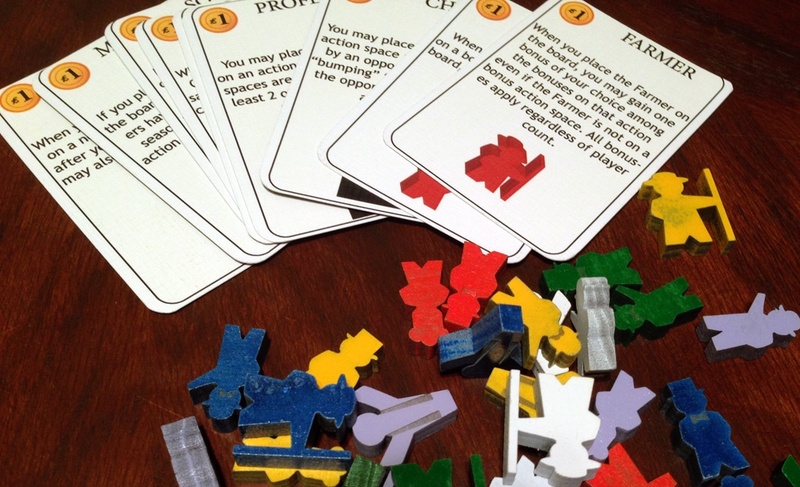 In our prototype copy, we were sent 7 different expansions to try out. We didn’t get the Arboriculture expansion, but that was released with the first Viticulture Kickstarter. Up until now there was no way to get your hands on Aboriculture, but thankfully it will be included in Tuscany. I’ll first try to briefly run through each of the expansions and then we can talk about the game experience with them. By the end, you should have a good feel with what will come with Tuscany (barring any additions via stretch goals). 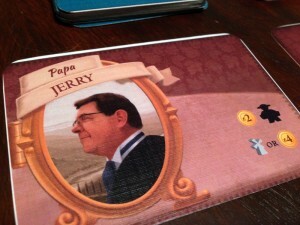 One of my favorite expansions in Tuscany is the Mama and Papa cards that introduce variable player setup. This introduces a variable setup for Viticulture. No longer does everyone start with the exact same cards and coins. Now, you draw a Mama and Papa and it designates what you start with. This is always 2 regular workers and 1 Grande worker on the cards (Grande workers are part of Viticulture 2.0 rules). But now, you will have a variable amount of money, cards, and possibly even a structure. Property changes the player’s fields from permanent fields to properties that they can sell to make a quick buck. The main board now has a “flip property space” that allows players to sell one of their properties for either ₤5, ₤6 or ₤7. They can also buy the field back later at the same price (using another action). At the start of the game, players are dealt out a patron card. This card works in 2 ways. First, when you use the “fill a wine order” action, you can instead fill your patron’s order by discarding any wine token of 5 or more. This gets you 3vp and activates your patron card. Each patron card has a special condition that will be hidden from the rest of the players. If, at the end of the game, you’ve met that condition, you will earn an additional 2vp. 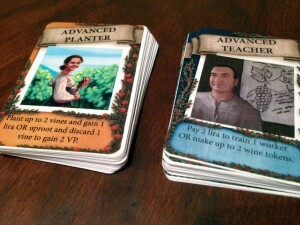 The Tuscany patron cards introduce a new way to gain VPs and also a way to get a boost at the end of the game. There are more visitor cards. The fit in well with the regular visitor cards and you probably won’t even notice the new ones from the old after a while. One of the nice things about the Advance Visitors is that they are usually useful anytime during the game. Many include an “or” condition that will help keep the card useful throughout the game. Yes, you heard right, even more visitor cards. These cards include more interaction with your opponents and some have “if, then” statements. The mechanics, while new, still integrate well in with the overall game play. 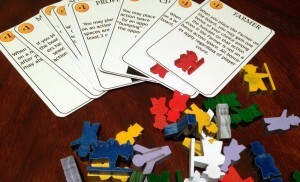 One of the more interesting expansions, the special workers allows players to recruit up to two unique workers per game. Players are still limited to their 6 total workers, but now they can pay an extra lira to get the specialist. The specialists are quite diverse and unique compared to the other workers. For example, the carpenter lets players take the building action whenever he is placed after his normal action. The farmer lets players gain the bonus from the action space it is on, even if you didn’t place him on the action space with the bonus. There are 6 special workers to choose from and you will randomly select two to use in any game. Each player will get the option of either recruiting a regular worker during the game or one of the selected two specialists. The extended board actually separates the game out into 4 separates seasons, in each of which a player can take actions. This is the most drastic addition to Viticulture. This replaces the main board from Viticulture with a new, four season board. The first thing you notice is that the wake-up chart has changed. You now gain bonuses in different seasons depending on when you wake up. It’s pretty interesting the way it works, where going first gives you no bonus and going last gives you the best. However, if you do choose to go last, you have to go first next round. Speaking of rounds, you no longer finish the rounds at the same time. When a player passes in winter, they now collect all their workers back and take their cleanup actions. They then choose their wake-up spot for next year. So instead of taking turns choosing first, whoever passes first gets the first choice. Speaking of seasons, the board is now divided into 4 seasons. Each season has 4 different actions you can take. Each player will have the opportunity to use any of the 4 available action spaces each turn before passing into the next season. Finally, Tuscany introduces a bit of area control. The lower left corner of the board has a map of the Tuscany region. Each player will have 6 influence cubes they can place via worker actions. When you place a cube in a region, you gain an immediate bonus (card or money). If you have the most influence in a region at the end of the game, you also gain VPs. There are only a few expansions that I really consider to be must haves for games. These usually add so much to the game play that I rarely ever want to play the game without it. Dark City for Legendary and On The Brink for Pandemic both come to mind. Well I’m tentatively going to place Tuscany square in that category now. I say tentatively because this was only a prototype and I’ll reserve my judgment for when I get my hands on the final, published version. 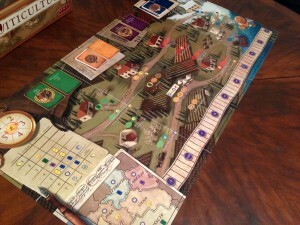 But as things stand, Tuscany is a fantastic addition to a game I already really enjoy. The specialist workers in Tuscany allow for each player to recruit one of two specialists during the game that will give them a bonus when placed. Once you’ve uncorked many of the expansion, the nice thing about some of them is how well they integrate with the game. Most of them can be played as if they were always part of the game, even if you don’t get viticulture to the table often. Only the extended board really requires some deeper explanation, everything else can just be dropped in and learned in minutes. One of my favorite modules in Tuscany is probably also the simplest, the Mamas & Papas. I love variety in a game and variable player powers is high on that list. Giving each player a different setup helps add some mystery and diversity to the game. It also easily and seamlessly integrates with the game and I can’t ever see a reason to not use it. The new visitor cards also help to fix some issues with Viticulture 1.0. The cards in Viticulture could sometimes be situational and drawing an early game card near the end of the game was pretty frustrating. Now, with the advanced visitors, many cards have two options, making them useful either in late game or early. This, combined with the new visitors cards that improve player interaction go a long way towards making Viticulture that much of a better game. I think the most drastic change will come once players dive into the extended board. This adds a lot to the game play and might squarely take Viticulture from the light-medium weight range into solidly medium. With this new board, I am really enjoying how the new wake up chart works. It changes my strategy some now that players get different rewards at different times. But I like the elimination of the communal round end because it opens up new strategic options. Since players collect their workers as soon as they pass in winter, a player who saves workers for the last season can all of a sudden have new options open up if they still have workers to place when someone passes. Finally, the extended board has a larger scoring chart (and no longer caps at 25). With the addition of the patron cards and the area control map, players could be getting quite a few VPs at the end of the game. This can help that final round be both tense and exciting as a close game could see a surprise come from behind victory. With the exception of the new extended board, I think the specialists expansion has the potential to drastically change the game play the most. We noticed the carpenter in particular was pretty powerful when we used him. But since everyone gets to recruit one, it wasn’t unbalancing. I think the specialist workers are unique and give you a whole new way to look at the game. Players will have to learn to tailor their strategies around which specialists are available in the game. 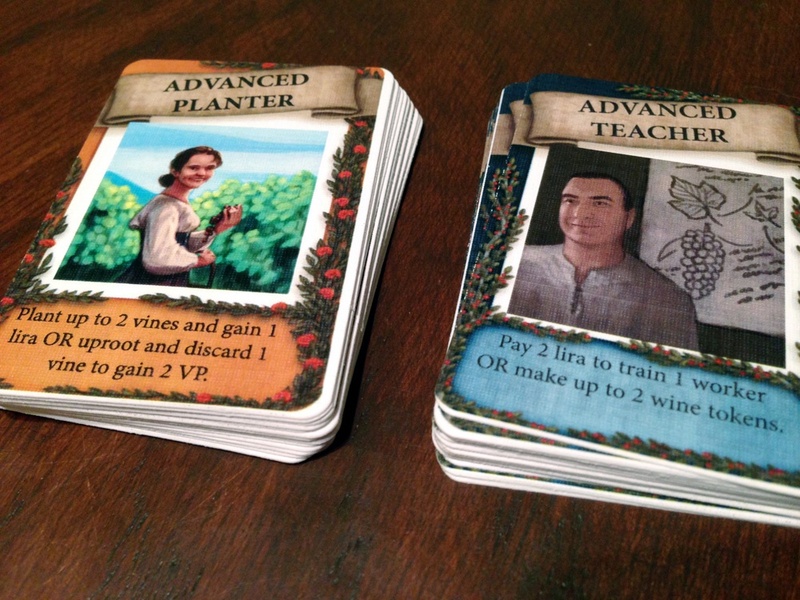 If you want your game of Viticulture to feel very different each time, then be sure to uncork the specialists module early on. The extended board in Tuscany now has an area control aspect. Players gain an immediate bonus for placing a cube and VPs at the end of the game if they control a region. I thought Viticulture was a good game after a few early players, and honestly, it has grown a lot more on me since then. It is now one of my top worker placement games. I was a bit skeptical on how much they could improve it with Tuscany, but Stonemaier Games have knocked this one out of the park. I’m always a bit wary with expansions. While I love variety, I don’t like when they change the dynamic of the game so much that they don’t really integrate with the game easily. This is especially true with already complex games. I never got the Dungeon Lords Expansion because I didn’t feel like Dungeon Lords needed any added complexity. But, despite throwing 8 new expansions at us, almost all of them fit in so smoothly with the game, they could have been part of Viticulture all along. Add that to the fact that this “legacy style” expansion has you adding them in one at a time, this should make Tuscany a “no brainer” for any Viticulture fan. You’ve now been warned. I half joked to Stonemaier Games that they’ve ruined Viticulture for us for the next 6-8 months as I don’t want to play “Vanilla Viticulture” anymore. That’s how much we loved our time with the Tuscany Prototype. Finally, I’m happy to report that the combination of Viticulture 2.0 rules and Tuscany help fix a lot of my gripes with Viticulture. To be honest, I wasn’t the biggest fan of 2 player Viticulture. Well that problem is gone now. We made sure to try playing with only 2 players with the new rules and expansions and it worked great! So all you spousal teams take heed now, there is something here for you. If you are a fan of Viticulture, run don’t walk, and back this on Kickstarter. You won’t be sorry. If you weren’t a fan of original, there actually may be enough here to change your mind (depending on what your objections were) and give this one another look. It’s rare when I can say that about a game expansion. If you are interested in the game, it’s now in funding on Kickstarter and is scheduled for delivery in November 2014. A pledge of $45 will get you a copy of the game and any stretch goals. You have until Wednesday, April 9th to become a backer so head over today if you are interested. Already backed at the metal lira coins level!